Losing an hour due to Daylight Saving Time is making me think about my mid-afternoon nap! I can’t wait! Plus, I left in such a rush this morning (my alarm failed to “spring ahead”) that I did not make my bed… it’s just ready and awaiting for me to jump in! If you’re one of those “Why make the bed if I’m only going to get back in tonight?” type of people, this is for you! The idea is simple, and so is putting it to use: instead of making the bed, just zip it up. The blanket of the Zip Bed is finished with a zipper, and is contoured to the bed’s aerodynamic shape. 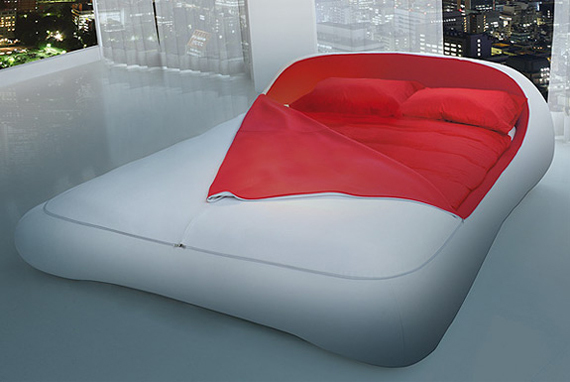 While the pillows and mattress sink into the bed’s plush structure. Mmmmm I can imagine myself in a zip bed right now! Gaga Helps Tsunami Relief + you can too!